Sunbury was platted in 1816 by brothers William and Lawrence Myers from the Borough of Forty Fort (near Wilkes Barre, PA). They were the sons of Philip and Martha (Bennet) Myers. While the names of the boys were well know, their family tree have any blank branches. Much of their history was unknown to me when we celebrated Sunbury's 175th in 1991. In 1760 Mr. Myers brought his family of four sons from Germany to Frederick, MD. Researcher George Larson has the father as Valentini Myers from Mainz, Germany, and the mother as Theresia. The four boys were Lawrence, born in 1754, Henry in 1757, Philip in 1760, and Michael. Larson found a tombstone for a Michael Myers (1768-1815) and his wife Elizabeth Fouts Myers (1770-1853) in Mt. Olivet Cemetery in Frederick, MD. They were the parents of Madison F. (Fouts) Myers who married Philip Myers daughter, Harriet, in Luzerne Co., PA. Thus Michael is found. Both Philip and Lawrence fought in the Revolutionary War - Lawrence was an officer. Some earlier researchers found a Lawrence Myers in the Berkshire Cemetery and thought he fought in the American Revolution. The one in Berkshire is the Lawrence who founded Sunbury and was not born until 1794. Following the war the three older brothers, Lawrence, Henry and Philip settled in Forty Fort, PA, which is near Wilkes-Barre. Their father and Michael remained in Maryland. 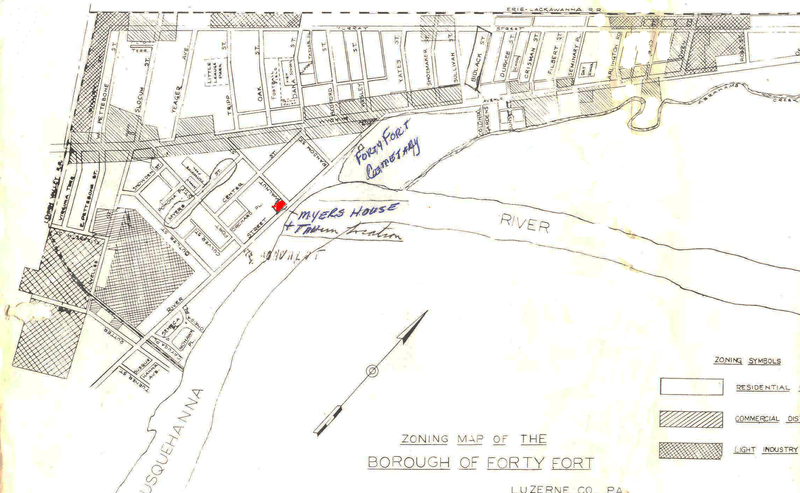 A 20th Century zoning map of Borough of Forty Fort showing the location of Philip Myers Home and Tavern. Following the Wyoming Massacre there were only forty men who returned to the borough to once again try to defend their land. Most had been captured and escaped. Probably this land was cheap when the Myers brothers were looking for a place to live following the American Revolution. Lawrence married Sarah Gore in January 1782. Many of the Gore family had been killed in the Wyoming Massacre. They lived in a hewn log homestead built in 1878. On July 7, 1790, he was sworn in as Justice of the Peace. He became an important man in the community. They lived a prosperous life until he died on November 26, 1810. His widow married Rev. Benjamin Bidlack. Lawrence and Sarah had no children so Lawrence’s nieces and nephews inherited his money. Henry died in Forty Fort on March 3, 1816. I still know nothing about him. 1. John (1791-1850) served as Justice of the Peace and Notary Public for 40 years. He married Sarah Stark (1793-1868) the daughter of Henry Stark. They had 1st Elizabeth (1815-1837) who married Col. Anthony Emley; 2nd Jane (1817-), 3rd Lawrence (1818-1905) sold Real Estate, opened a brokerage and married Ann Elizabeth Eichelberger who died in 1866 leaving their daughter Georgiana. Lawrence then married Sarah Sharp and they had five children. The oldest Mary Margaret married 1st Daniel Strebeigh Bennet ( a descendent of Thomas Bennet) and when he died, she married John Biesecker Yeager. Nothing is known of this Lawrence and Sarah’s other four children. John and Sarah’s 4th child was Martha and the 5th was Harriett who was born 6-20-1823 and married Michael Eichelberger. John was 6th child, Henry P. was 7th and married Lucinda Church, the 8th child was Charles who married Martha Pettebone and last child was Sarah (1829-) who married a man named Herman. Lawrence (1794-1829) and William (1796 - 1824) were the second and third children of Philip and Martha and the founders of Sunbury. 4. Sarah (sometimes called Mary 1798 - 1881) married Rev. George Peck. 5. Thomas (1802-1887) remained in Forty Fort and was the Sheriff. 6. Harriet (1817-1899) married her cousin Madison F. Myers, son of Michael. 7. Betsey is a mystery. Did she come to Ohio as William’s wife?? After Uncle Lawrence Myers died in 1810 leaving his money to his nieces and nephews, Lawrence and William took off for Ohio. 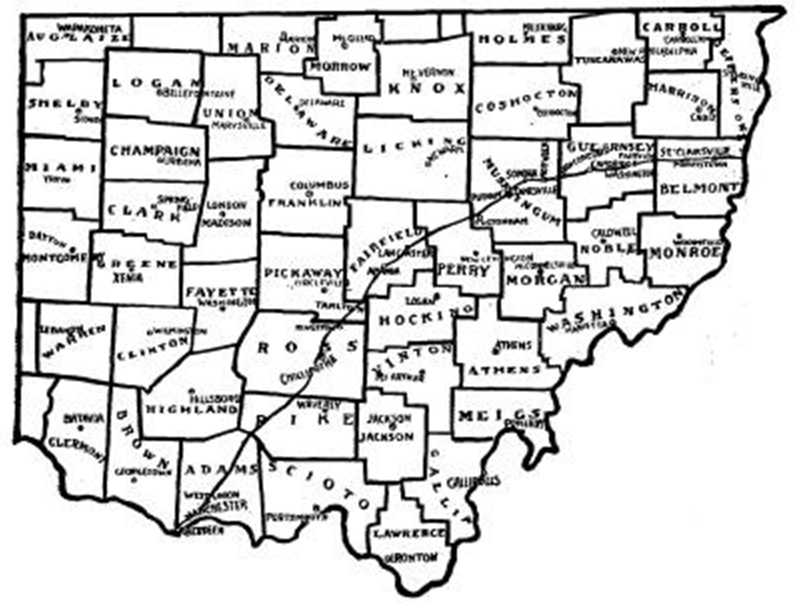 It appears the boys traveled along the Zane Trace, through Zanesville and probably to Berkshire. Dr. Jonas Stanberry practiced in Zanesville but also spent much time and money investing in unseen land opening up in Ohio. His partner Joseph Constant was younger and more mobile moving constantly to be where the deals were. Sunbury passed through their hands to Daniel Alden then Gideon Ousterhaut to William Ousterhaut who sold 100 acres to 19 year old William Myers for $800. A year later Lawrence Myers bought 200 acres from Daniel Alden for $1600. Both of these deeds were signed by Justice of the Peace John Shen but I have not found him and do not know where the transactions took place. William was 20 years old when he and Lawrence platted Sunbury. He was married to Betsey whose last name is lost. Some census records say she was born in Connecticut. So far I have not found if they married in Pennsylvania, en route to Ohio or after they came here. In 1816, William sunk vats and began manufacturing leather ½ mile southeast of Sunbury across the creek from the saw and grist mill. The Manville Mill (shows as a still on one map) was on the town side of the creek, to the left of St. Rt. 37 when leaving town. The tannery could have been in the low land across the road or where Rattlesnake and Big Walnut meet. 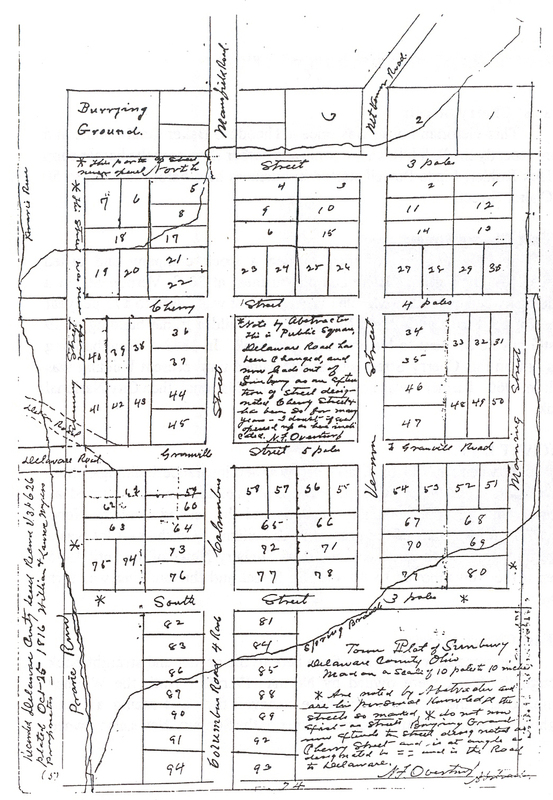 Norman F. Overturf signed this abstract rendition of the original plat for Sunbury laid out by the Myers brothers in 1816. Overturf was Probate Judge in Delaware County Feb 1888 to Feb 1894. Note he put * on streets which were never opened. I am guessing William's family lived on lot 51 on Granville Street. Tax records are often difficult to decipher but apparently log cabins did not count as houses. The 1819 tax papers for Sunbury Township show Lot 51 the most valuable of William’s properties with 1 horse and 3 veal cattle and tax of $2.33. Lot 59 also without a house was valued at 25. Lot 51 was on the southwest corner of Granville and Morning Streets (across the street from Certified Service Station in 2016) and Lot 59 was on the southwest corner of Granville and Columbus Street across from the Myers Inn. Lot 51 was closer to his tannery. If the plat map is printed in this newspaper, keep it so you can see how the town evolved as we talk about the people, and buildings.